Control your blood sugar, practice good self-care, and stay vigilant to avoid diabetic foot problems. 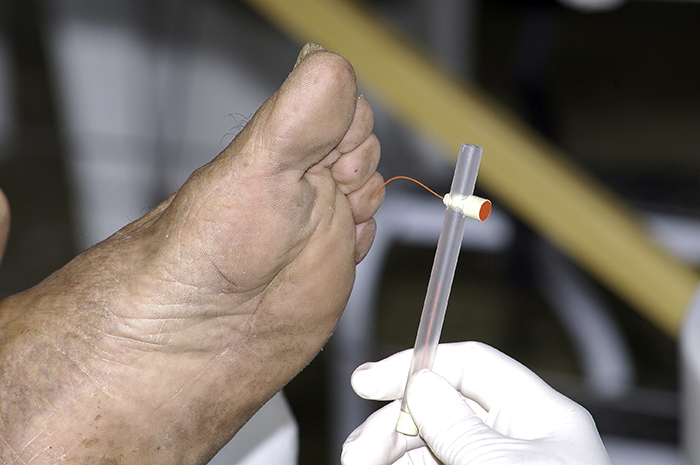 Doctors use a monofilament test to determine the level sensation in diabetic feet. The nervous system can be thought of like a tree, with the spinal cord as the trunk and the peripheral nerves of the feet as the tiniest branches. And, just as those miniscule limbs are easily broken by the elements, so too can the small nerves in the feet be damaged by diabetes. This nerve damage, or neuropathy, and the loss of feeling that results from it are a key pathway that leads to diabetic foot complications, the worst of which being amputation. The possible loss of sensation and circulation in your feet can cause major problems and put you at high risk of requiring an amputation, which is a major fear of people living with diabetes. By controlling your blood sugar, protecting your feet, and working with your healthcare team, you can take steps to protect your feet and avoid complications. Wash your feet daily, and dry them thoroughly, particularly in between your toes. Apply a moisturizing cream to the tops and bottoms of your feet, but not between your toes. Wear socks and shoes whenever you’re on your feet. Avoid going barefoot. Make sure your shoes fit well, and check the insides for any defects that could injure your feet. If your feet feel cold, wear warm socks. Do not warm your feet with electric blankets, hot water bottles, or heating pads. Promote blood flow to your feet by elevating them when you’re sitting and not crossing your legs for extended periods. Move your toes and ankles up and down for five minutes, two to three times daily. Poorly controlled diabetes can damage delicate nerve fibers and cause diabetic neuropathy, making it more difficult to sense injuries to the foot. Although neuropathy can develop at any time, it’s more common in older adults and those who have had diabetes for a longer duration, with the greatest prevalence among people who have had diabetes for at least 25 years, according to the National Institutes of Health. Many diabetes patients also have peripheral artery disease, or PAD, which reduces blood circulation to the legs, feet, arms, and other locations away from the heart. Inadequate blood flow limits your foot’s ability to fight infection and heal from injuries. This combination of poor healing and an inability to sense injuries to the feet make people with diabetes more susceptible to foot ulcers and infections that could result in amputation. Some of the hallmark signs of diabetic neuropathy and PAD in your feet include discoloration (you may notice that your feet appear darker), a decline in (or lack of) hair growth, skin changes (dry, peeling, cracking skin), feet that constantly feel cold, tingling/burning/numbness, and cramping. Tell your doctor if you experience these symptoms. And, just as you should have your eyes checked annually if you have diabetes, undergo yearly foot exams to identify any signs of diabetic foot complications. If you’ve been living with diabetes for more than 10 years, if you have a history of blood sugar levels that are not under control, or if your condition hasn’t been treated for an extended period of time, you’re at a higher risk of having diabetic foot problems. Visit your doctor for a thorough foot exam every year, especially if you’re over the age of 60. 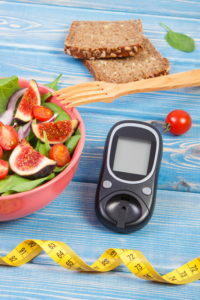 One key to preventing foot problems and other complications of diabetes is to manage your blood sugar carefully. Work with your healthcare team to keep your blood sugar within the range your doctor recommends. Inspect your feet daily, looking for sudden changes to skin color, red marks, swelling, cuts or breaks in the skin, or ingrown toenails. Keep an eye out for calluses. A common problem in diabetes patients, calluses can thicken, crack and ulcerate. You can help to control calluses by pumicing, but do so only after having a physical exam to gauge the sensitivity of your feet, experts advise. Never cut away calluses or corns on your own without consulting your doctor. Shielding your feet from harm is critical for preventing diabetic foot complications. That means wearing socks and shoes and not walking barefoot, whether you’re in your home or outdoors. Accidents can happen, so keeping your feet protected can make a huge difference. Prevention is a better way to handle diabetic feet as opposed to fear. artery disease, blood sugar, blood sugar levels, complications of diabetes, cramping, diabetes, diabetic, diabetic foot, diabetic foot problems, diabetic neuropathy, foot problems, health, infection, people with diabetes, peripheral artery disease, skin, sugar, sugar levels, ulcers.